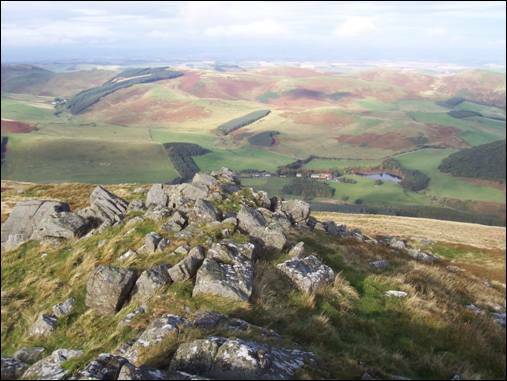 Every time I wander out across the wide open spaces of the Cheviot Hills I seem to discover yet another mouth-watering route still to be explored. Familiarity reveals more possibilities. The list just grows and grows. Rugged Wester Tor towers above Hethpool in the College Valley from where it looks mightily impressive. The rarely-used direct approach, via the steep west facing slopes, involves some 1240 feet of height gain in less than one mile of walking. I had never attempted this particular route before and, with the sun just about to peep its head above the skyline, I was looking forward to testing my current level of fitness. Muscles primed, I headed past the two storey holiday cottage of Hethpool Mill towards the start of my upward journey close to the lonely remains of Harrowbog. Here, in 2006, a Newcastle University-lead excavation uncovered a coin dating back to 1789 suggesting that the farmstead might have been abandoned around that time. As I reached the bracken-invaded ruins I was surprised, after more than 200 years of neglect and steady decay, to find any part of the buildings still standing. Excruciating is probably the best way to describe how it felt plodding alongside the drystone wall worming its way, with a vengeance, towards the rocky promontory of Wester Tor. A recently erected deer fence provided an early additional hurdle whilst a faint trace did little to ease the pain. I broke my stride endlessly to admire the superb views across the border hills to the lush Scottish lowlands. Below me the receding College Burn snaked across the valley floor and the tree-encircled Hethpool Lake added extra interest to the near-perfect picture. Eventually the wall decided, in a tumbledown sort of way, to wander off to my right and the temptation was to follow its faltering footsteps. But with Wester Tor now clearly in my sights, a few hundred metres ahead, I stuck relentlessly to my straight-line approach. On the rock-strewn summit I caught my breath and soaked up the far-reaching panorama. A multitude of green, hump-backed hills vied for my attention whilst the thin band of the cold North Sea twinkled along the distant eastern horizon. I could have stayed all day but this was just the beginning of a much longer walk which would, in the course of the next five hours, lead me on an 11 mile rollercoaster journey across some of the hills which stand guard over the beautiful and remote College Valley. So, with a spring in my step and a sandwich or two in my sac, off I went to my next high point of the day, the triangulation pillar-topped Newton Tors.